A link is an auto generated address that when selected will take someone directly to the document the link is for, within the MatterSphere Document Management System. 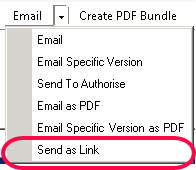 A link can be inserted into an email for others to access. Amends can be made by several people to the one document at source – no collation of amendments from several documents required. Anyone accessing the document can be sure its the most recent version. No need to clutter many email inboxes with unnecessary attachments. The only restriction to the use of links is that the recipient of the link must have access to MatterSphere. This cannot be used for external/client access to documents, for security reasons. To send click Save and Send to save the email to the matter. Alternatively click Send to send without saving. See the Guide below and the training video for further instruction. More hints and tips are available on this website and training sessions can be provided in accordance with your requirements on application.